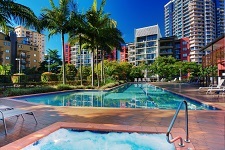 => Click on SPECIAL OFFERS below for offer details on Short Term Accommodation & Long Term Furnished Accommodation Brisbane and QLD. 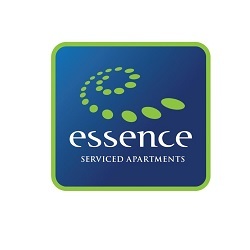 Essence Serviced Apartment is a stylish, sophisticated, spacious and fully furnished serviced apartment hotel, providing 61 guest apartments. All accommodation rates include a light breakfast, WiFi, secure car parking, gym pass and access to our guest lounge with Billiards table and Garden Terrace. All of which are designed with guests comfort in mind. 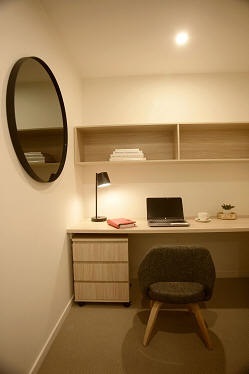 The Studio Apartments are perfect alternative to a hotel room with full kitchen facilities. The One and Two Bedroom Apartments or Suites are ideal for families, colleagues or large groups looking for a home away from home with full kitchen facilities, choice of King, two Single beds or Queen beds plus laundry facilities within the apartment or shared facilities. 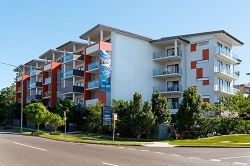 Essence Apartments is located in the heart of Chermside and provides immediate access via our exit on level 1 to the Prince Charles Hospital and the Holy Spirit Northside Private Hospital. It is just minutes north of Brisbane's CBD, and only 10 minutes from Brisbane's Domestic and International Airport terminals, plus a short walk to Westfield Chermside, and within driving distance to Suncorp Stadium, Brisbane Entertainment Centre and Brisbane Showgrounds. We specialise in accommodating the needs of relocation including individuals and teams working on projects, as well as those relocating for a new job or with family members. * Complete with open plan living spaces, zoned living and sleeping areas, dedicated workstations and well-appointed kitchen and laundry facilities. 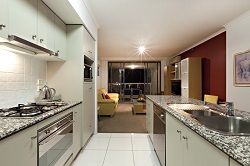 * We offer a variety of apartment configurations to suit individuals, couples, families and large groups. These consist of studios, one bedroom, two bedroom apartments and suites. * We provide a selection of bedding configuration to suite individuals, couples or families including Queen Beds, King Beds or rooms with up to 4 single beds. * Property provides staff from 7am to 10pm and 10pm to 7am telephone staff assistance for all property enquiries. Security visit the property several times throughout the evening or to attend to any afterhours enquiries. * Specialised and dedicated customer consultants who provide a seamless booking process. We understand that being away from home for just a couple of days is different to being away for an extended period of time. 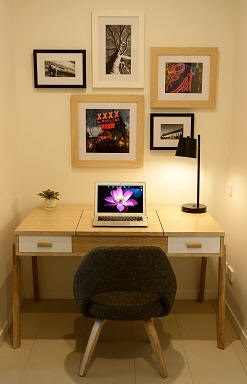 If you need to be away from home for a month or more ask us about our extended stay weekly rates. Our extended stay weekly rates have to be pre-booked and committed in advance. 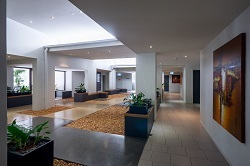 We specialise in Patient accommodation, business relocation accommodation, and will be delighted to provide you with a flexible, tailor made accommodation package for your company and executives requirements. Simply contact us and our sales manager will process your request and contact you directly. Accommodation for groups attending events, or groups of different people travelling to come together can also be accommodated with our meeting room facilities available for use. 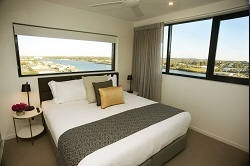 Whether you're coming to stay for business or leisure, for a night, a week or a month, we have a place for you to stay. The Docks on Goodwin is conveniently located in the heart of Kangaroo Point with Brisbane CBD just a short ferry ride across the river. 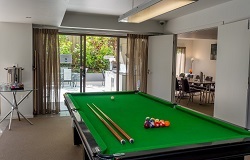 Two towers of accommodation provide secure and comfortable inner city living at this popular residential address. The Docks on Goodwin is the perfect choice for short and long term stays, with a choice of one bedroom studios with kitchenette or fully self contained one and two bedroom apartments with full kitchen facilities. All rooms include a private balcony, full laundry facilities, air conditioning, cable television and free wireless internet access. Facilities include a gymnasium, 25m heated lap pool, spa, sauna, tennis court, barbeques, wide screen theatre, free wireless internet access and free secure car parking. Chargeback facilities with local restaurants also available. The Docks on Goodwin has a conference room and caters for boardroom style conferences suitable for up to 12 people. 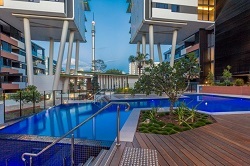 The Docks' Kangaroo Point location connects to the CBD and Fortitude Valley via Brisbane's landmark Story Bridge, which also provides an easy 20 minute transit to Brisbane Airport's domestic and international terminals. 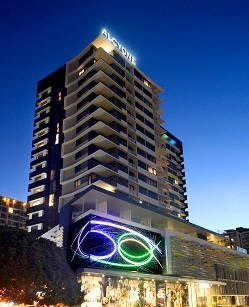 Only 250m from ferry services, guests enjoy superb access to the city and the finest attractions on offer in Brisbane - CBD, Botanic Gardens, Brisbane Convention and Entertainment Centre, Queensland Performing Arts Centre, Gallery of Modern Art, Southbank leisure and dining facilities, and the "Gabba". 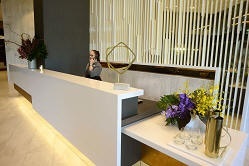 A Reception office and on-site management provide for guests' every need, including local tour arrangements. 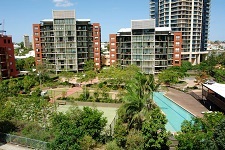 "The Docks on Goodwin is conveniently located in the heart of Kangaroo Point, just minutes from Brisbane CBD." 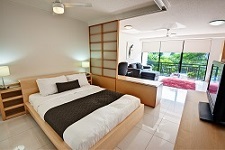 Astra Apartments has been providing serviced executive apartments for extended stays since 2001. We're a preferred supplier to many leading corporations, relocation firms and corporate travel management companies. 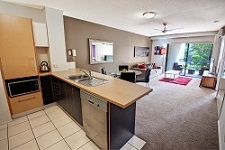 Our Brisbane apartments are modern, spacious, tastefully furnished and feature a fully-equipped kitchen and laundry. 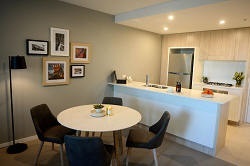 Everything needed to be comfortable is included making our apartments ideal for weekly, monthly and longer stays. One, two and three bedroom apartments are available. 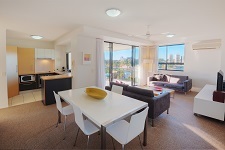 Our Brisbane serviced apartments are available in two locations: Brisbane CBD and South Bank. Both are convenient to corporate headquarters and close to transport links. Shops, cafes and supermarkets are within easy walking distance. We offer discerning travellers a relaxed 'home away from home' accommodation experience. With extra space, privacy and a fully-equipped kitchen and laundry you have everything needed for a comfortable extended stay. 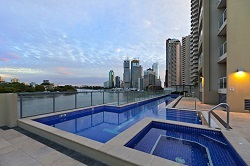 All apartments include access to a pool and gym. Our rates are consistent all year round with no high season spikes and include a weekly service clean. Any additional fees, such as parking, are clearly listed on our quotes. You'll never find any unexpected items on your final invoice. Knowing what you'll be charged makes it easier to budget executive accommodation. Whether you're booking with us or staying with us, our dedicated team of Managers, headed up by Sean Lennon in Brisbane, are available to assist 24/7. We guarantee a 24/7 'Meet And Greet Check In Service'. The person staying in the apartment is met, shown in and given a full orientation before the keys are handed over. A Manager is then on call throughout the stay. 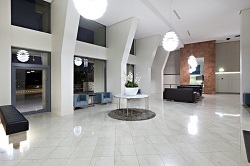 With multiple apartments available we can easily accommodate entire teams in the same building. This is often convenient for the team and makes the booking easier to manage. Get in touch, we're here to help and look forward to welcoming you to Astra Apartments. Alcyone Hotel Residences is a new development at the epicentre of Brisbane's most sought-after destination, Portside Wharf. 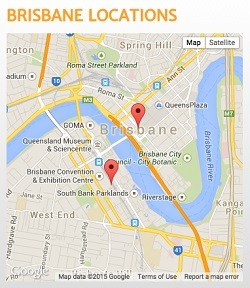 Providing convenience to Brisbane's CBD, Eagle Farm Business Park, Trade Coast Central Business Park and beyond. Alcyone's exclusive luxury apartments seamlessly blend the upscale yet relaxed Portside lifestyle where guests enjoy their stay amidst the hub of restaurants, cafes, fashion boutiques and lifestyle offerings. The LED digital artwork display, which is the largest of its type in Australia, offers a hint that we're unlike any other hotel. 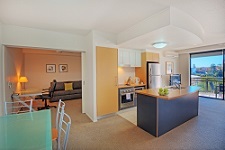 Our spacious apartments deliver great value for your money without sacrificing luxury amenities. Perfect for long or short stays, a remarkable accommodation experience awaits in a place where the warm comforts of home meet the unsurpassed amenities of a hotel. Alcyone Hotel Residences offers stylish, modern accommodation for business travelers in search of an extraordinary travel experience. 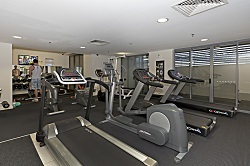 When staying in Brisbane for a few weeks or months, our apartments and resort-style amenities like an outdoor pool and fitness centre ensuring a relaxing stay that will exceed your every expectation. All apartments feature balconies, full kitchens, comfortable living areas, washer/dryers and walk in showers. 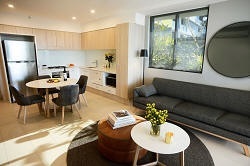 Fully air-conditioned apartment featuring natural lighting, stone benchtops, with premium tiling and carpet throughout. 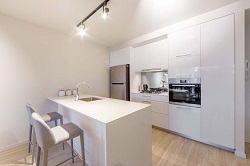 Full kitchen including dishwasher, washing machine, dryer and bathrooms with shower and designer tapware. 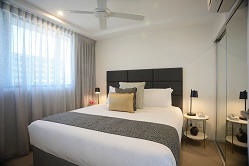 Two bedroom, two bathrooms, fully air conditioned apartment featuring natural lighting, king bed in the main bedroom and queen bed in the second bedroom , balcony , stone benchtops, with premium tiling and carpet throughout. Full kitchen including dishwasher. Bathrooms with shower and designer tapware. Washing machine and dryer.